MOSCOW, October 19 (Itar-Tass) - Gazprom received an invitation to start geological prospecting on Alaska shelf, said Gazprom board chairman Alexei Miller in an interview with the Rossiya TV networks, circulated by the Gazprom press service. Executives of the Russian company and specialists from other countries participated in a scientific seminar in Alaska on development of oil and gas deposits. According to Miller, Gazprom will hold “a new round of meetings and talks in the near future on which blocks (in Alaska) could be offered to us by our American colleagues”. “This will be also closely examined by us from the viewpoint of geological data,” Miller said, adding that he “will study proposals which were offered to Gazprom to work on the Alaska shelf, including blocks in the Chukchi Sea”. Besides, Miller hopes “to turn in the near future from discussions to the next move: formalising relations concerning research work, Gazprom’s participation in explorations and development studies in Alaska”. Gazprom head admitted “although there is much talk on plans of developing the Alaska shelf and concerning creation of new gas transport routes, there is no real progress in anything”. He claimed that “even according to the most optimistic plans, if we are to speak about gas transport projects, the ball will start rolling only in 2018”. Miller emphasised the importance of the so-called pre-project stage when research studies are very important. “Incidentally, Gazprom’s experience in implementing such large-scale projects in the north could be very handy in this case,” he added. In Miller’s opinion, “Gazprom’s arrival in Alaska is a logical outcome for the development of a gas market”, since “there is now need for developing new deposits and deliveries of new volumes of gas to markets”. He noted that the US is not only the biggest consumer, but also a big gas producer. It imports annually 130 billion cubic metres of gas. This notwithstanding, it does not develop big deposits, including the Alaska shelf. “Licenses for those deposits were given long ago, in the 1970s, but no serious moves have been made to develop those deposits over the past 40 years,” Miller specified. To Miller’s mind, the Gazprom experience looks alluring in this situation. Gazprom is a company, operating now in Russia’s North, the main country’s production potential (some 80 percent of gas output) concentrates in the Yamalo-Nenets Autonomous Area. “We have accumulated very rich experience both of production and construction of gas pipelines, creation of transport and social infrastructure over several decades of work under conditions of Russia’s North,” Miller said. He put his company in the first place in the world according to experience of work in the north. “Alaska has very similar conditions with our work in the Russian North. Those are the same latitudes and climatic conditions, to which we are accustomed. Gazprom is interested in boosting its cooperation where we can be needed with our experience and our knowledge,” said Gazprom chief. He noted that the Russian side “sees interest of American colleagues in work in cooperation with Gazprom. Gazprom carried out a presentation in Alaska of its own experience of work on Yamal Peninsula shelf and new technologies of gas transportation. 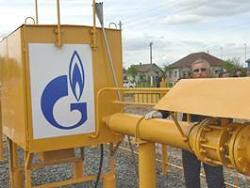 “It is Gazprom in Russia that started implementing construction of gas pipelines of a new generation. This experience is unmatched anywhere in the world,” Miller underlined. He added that these technologies fully take into account the most stringent ecological demands and show “how can be implemented in a sparing regime large-scale projects under conditions of very fragile ecological systems of the north”. Miller noted that he shared the company’s experience at the seminar on resolving social questions. “In the Russian North, we implement large-scale social and humanitarian programmes of cooperation with indigenous population, programmes for professional schooling and training of indigenous ethnic groups, maintaining their every-day life and traditions. The Gazprom experience in this sphere can be applied here in Alaska,” Miller said with confidence. The Gazprom leadership also advised their American colleagues to choose one of the two future projects of building a gas trunk pipeline via Alaska and via Canada to the US domestic market. “In our opinion, implementation of two projects of trunk pipelines is redundant, unsubstantiated and economically inexpedient. Miller also said that liquefied gas could be an alternative to transportation of gas by pipelines. This alternative will meet requirements of Alaska indigenous population. Therefore, it is necessary to examine a possibility of building factories on liquefying gas in the north and transporting it to the US domestic market. Miller is convinced that “the volume of gas consumption in the US will continue to rise”. “And there is no alternative to gas in the medium-term perspective,” Miller emphasised. There was an article today in my newspaper about the 1st Russian Orthodox Church in Cuba opening up. Did you know about this? Yes.I watched the running commentary this very day.